Dukanes installation-friendly 8979WUA LCD projector is designed to provide maximum presentation impact in mid to large venue applications. It offers a versatile array of innovative, performance-enhancing features along with advanced video display technology providing bold, brilliant colors with incredible image clarity and uniformity. Plus, with motorized zoom, focus and superior lens shift, and a variety of lens options, the 8979WUA is at the top of its class when it comes to installation flexibility. 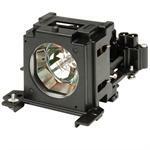 With a tough magnesium die cast body, the 8979WUA is one of the most durable projectors available today. All this, and with a lower cost of ownership. For added peace of mind, Dukanes 8979WUA is also backed by a generous warranty and our worldclass service and support programs.